For over 10 years, the United Nations has led an international sanctions regime targeting North Korea. Now that China has joined, sanctions are starting to make a noticeable impact on the North Korean economy. “All sanctions regimes face a big challenge: getting the countries that trade with the target to coordinate. This has been a huge obstacle since the United Nations moved to sanction North Korea, with the first multilateral sanctions resolution voted after the country’s first nuclear test in 2006…In 2017, China agreed to ban a variety of North Korean exports — coal, iron ore, marine products, and goods from the country’s emergent textile and garment industry. These sectors account for almost half of North Korea’s known exports. These measures came on top of other steps to make it increasingly difficult for North Korea to access the international financial system. And China put a significant cap on oil exports to Pyongyang, potentially the most damaging measure to date. After over a decade of international sanctions, China was one of the only holdouts, accounting for 90% of North Korean trade. Now, with China’s cooperation, sanctions against North Korea have resulted in the leverage needed to bring them to the negotiating table. “The concerns now rest with a U.S. administration prone to grand gestures but with a foreign policy bench depleted to some extent by turnover. The United States faces the challenge of coordinating at the multilateral level and with China to maintain the sanctions pressure that will lead to talks. But this also means committing to negotiations beyond these initial summits. If the United States throws away the diplomatic channel altogether — as incoming national security adviser John Bolton has suggested — the United States could find that China’s patience for maintaining the sanctions regime will erode”. Moderate sanctions lower the chance of war, but weak or overly destructive sanctions can increase the chance of war. Sanctions can lead countries to diplomatic negotiations, which in turn contribute to future cooperation. Sanctioning governments convey strength and solidarity through shared condemnation. Sanctions are a tool of diplomacy that provide governments with a nonviolent method to reduce another country’s military power. The parties involved in conducting and receiving sanctions, as well as those observing the sanction campaign from the outside, benefit from an effective nonviolent method to address conflict. With time, these methods can bring the conflicting parties to the negotiating table. As David Cortright states, “[sanctions] are useful for persuading an adversary to come to the bargaining table, but they must be accompanied by meaningful incentives for cooperation”(*1). Once a successful process of cooperation has begun, it is more likely that agreements and further cooperation can be achieved. It is important to observe the success of a sanction regime though a wide lens, and not just by the immediately observable results. Just because a country or group of countries failed to meet all of the objectives set before sanctioning does not mean that the sanctions failed. Rather, success should be weighed against the sanctions’ ability to balance power and the human and economic costs from a war that the sanctions may have helped prevent – not the potential hardships that come during a sanction regime. “Those North Korea Sanctions Might Be Working. Here’s Why.” By Stephan M. Haggard for Monkey Cage. 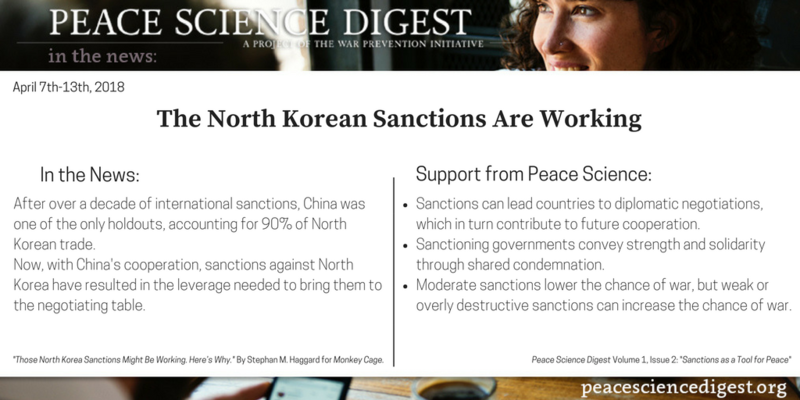 Peace Science Digest Volume 1, Issue 2: “Sanctions as a Tool for Peace“.